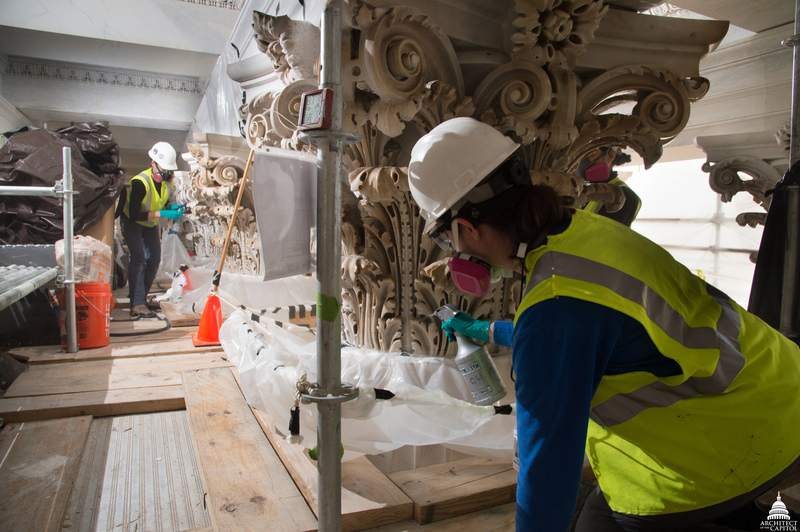 The Corinthian capitals with elaborate carvings of curled leaves, ornate flowers and stone scrolls, as well as the pediment statues, have stood exposed to the elements since they were installed 150 years ago. They have no protection against the snow, sleet and ice that coat the Capitol every winter. Despite the toll this takes, the Architect of the Capitol's (AOC) Historic Preservation Officer Mary Oehrlein observed that, "It's quite possible that there’s been no comprehensive restoration of the exterior of the building since the early 20th century. So, it's about time." 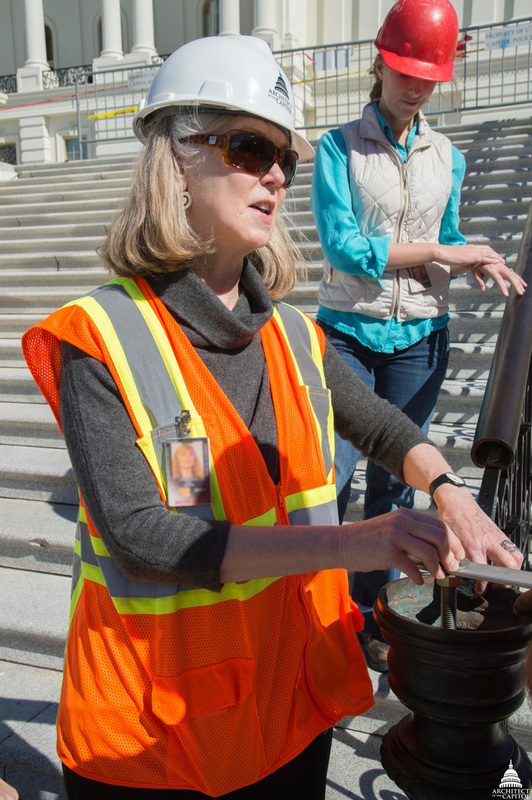 Historic Preservation Officer Mary Oehrlein inspects stone at the Capitol. Soft snow seems no match for stone, but when water collects in the intricate stone decorations and then freezes, it expands, pushing the stone slowly, yet inevitably, apart. To many, it's difficult to see the need for restoration from the ground. Oehrlein recalled approaching the Capitol for the first time, "It's a beautiful building, and if you don’t look closely, you don't see the damage." However, the stone has been deteriorating for decades, especially the finer details, hand-carved by artisans. Due to a shortage of experienced stone carvers in the United States, the original craftsmen were brought from Italy, along with their families, and provided housing in Washington, D.C. The grounds around the expanding Capitol became filled with blocks of marble, awaiting the carvers' hammers and chisels, which converted them from blank slabs to elegant scrolling leaves and fluted columns. Temporary wooden sheds were built to shelter the carvers from the weather, but they weren't big enough to contain all of the work. For the massive columns, long tents were strung up over the smooth cylinders. It was here that these Italian artists created the fluting and other details that completed the columns before they were hoisted into place, where their capitals were mounted on top. Conservators consolidate the stone, strengthening it against the elements. Time has taken its toll on their work, however. "At the top of the columns, you'll see that the scrolls that should be there are no longer there, which means all of that stone has fallen at some point," said Chris Lear, U.S. Capitol Exterior Stone and Metal Preservation Project Manager. He described how the remaining stone is weakened, "When you touch it, it just turns to sand." The process is known as "sugaring" since the rock is reduced to a pile of white grains. In the 1990s, the head of the Capitol Masonry Shop would call Oehrlein and report, "I've got a bucket of stone. Do you want it?" When she asked how big the pieces were, he would always reply, "It's just sand. We swept it up." "Because of the condition, all of the detailed carving gets cleaned using a laser, which takes off the carbon deposits," said Lear. That is followed with a detergent formulated for the specific type of stone in that location. There are five different types of marble on the Capitol, each with a unique chemical structure that requires a specific detergent formulation to clean it without causing damage. Once the stone is cleaned, it is strengthened through a process known as consolidation to protect against further damage. Consolidation involves applying hardening agents, which are absorbed by the stone. Each application has to be done within strict temperature and humidity parameters. As Lear observed, "The challenge is that it's all outside work. The elements are our biggest obstacle." Stone conservators built enclosures, but just sheltering the stone isn’t enough. "In the winter we’re in containments with heat. In the summer, we’re air-conditioning the containments," said Lear. Once the stone is within the prescribed parameters, conservators must brush on multiple coats of two treatments, letting the stone fully absorb each one before proceeding. 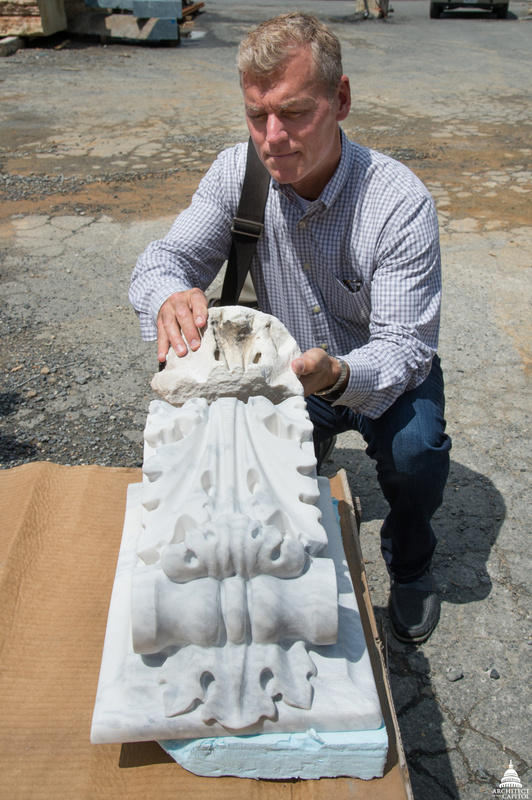 Project Manager Chris Lear compares an original, weathered stone carving with a newly carved replacement. The stone that was too damaged to save has been removed, and those ornaments are being recreated. The simple pieces are being replicated by an automated carving machine off-site, where they will be hand-finished. The more complex items are being recreated by a stone carver on-site, who is carving from the same stone blocks the original craftsmen worked, although he has the advantage of modern power tools. As the Capitol has expanded, the AOC has removed and stored stone for use in future restoration work. For this project, that stone is being returned to the Capitol, where it is carefully color-matched to the existing stone. Similarly, the carver is working to match the style of each of his predecessors. Starting with a square block of stone and an original ornament, a stone carver skillfully recreates one of the many stone ornaments damaged by exposure to the elements. "It's difficult to get the complex shape of the leaf," says Oehrlein. "The machine can't do that. In addition, each column capital is slightly different. They weren't carved by machine; they were carved by men who had a model, but they were doing their own interpretation." The masterful craftsmanship and meticulous care involved in preserving the stone does take time. Those minutes will be multiplied and magnified in the moments of wonder as this beautiful building continues to inspire visitors in the centuries to come. THANK YOU FOR YOUR DEDICATION, ESPECIALLY THE CARVING. The Capitol dome appears on TV news shows all the time so we've followed the restoration work. It has turned out beautifully; looking markedly better. Well done! Thank you for your work.